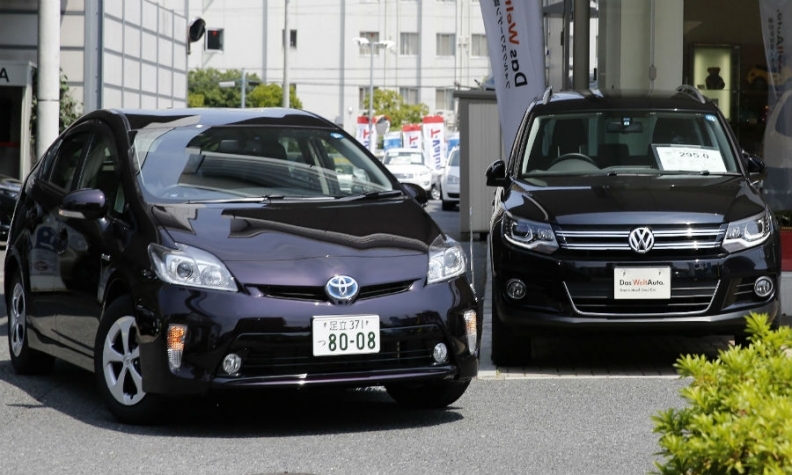 A Toyota Prius and a VW Tiguan are pictured at a Tokyo dealership. TOKYO (Bloomberg) -- Volkswagen Group surpassed Toyota Motor Corp. to become the biggest automaker by deliveries in the first half, putting the company on track to capture the worldwide sales crown three years ahead of its target. Toyota sold 5.02 million vehicles in the six months through June, trailing the 5.04 million that Volkswagen reported earlier this month. Deliveries declined 1.5 percent for Toyota and 0.5 percent for Volkswagen. Toyota's sales numbers include the Daihatsu cars and the Hino heavy truck brand. VW's numbers include the MAN and Scania truck brands. General Motors, the third-biggest automaker by global sales, said earlier this month that its worldwide deliveries fell 1.2 percent in the first half to 4.86 million vehicles. Volkswagen benefited as car demand in Europe accelerated at the fastest pace in 5 1/2 years, softening the blow from a slowdown in China, its biggest market. To achieve its goal set in 2007 to become the world’s largest automaker, Volkswagen will have to withstand the slump in demand brought about by China’s volatile stock market and competition from cheap SUV models by Chinese brands. A global auto industry that has expanded every year since 2009 faces a stalling market in China, collapsing demand in Russia and weakness in some Southeast Asian and South American countries. In the U.S., industrywide deliveries increased just 4.4 percent during the first half of the year, putting the market on track for its smallest annual gain since the recovery began. “The extent of the recent softness exhibited by many markets was not anticipated at the beginning of the year by either the companies themselves or by the market,” Clive Wiggins, a Tokyo-based analyst at BNP Paribas, wrote in a report Monday. Japanese carmakers may cut sales forecasts and need cost reductions and currency gains to avoid having to reduce their outlook for earnings, he said. China’s passenger-vehicle sales fell for the first time in more than two years in June as economic growth slowed and a stock-market rout dented consumer sentiment. Global automakers will manufacture fewer vehicles in China this year than they are able to because of slowing demand, a reversal after years of rushing to build new factories, Sanford C. Bernstein analysts said in a report this month. Toyota bucked the market trend with a 42 percent gain during the month and boosted sales during the first half by 10 percent to 512,800 vehicles. Volkswagen’s deliveries during the first six months fell 3.9 percent to 1.74 million. In Europe, the longest stretch of economic growth for the 19 countries using the euro has put auto sales on more solid footing in countries where Volkswagen dominates. The German carmaker boosted sales in its domestic market and in broader Western Europe by more than 6 percent, helped by the VW Passat sedan and Porsche’s Macan compact SUV. Toyota’s registrations in Europe climbed 5.7 percent during the period, according to ACEA, the European automakers association. In the U.S., Toyota outpaced the broader market by posting a 5.6 percent gain, driven by demand for its Lexus NX and Toyota RAV4 compact SUVs. By comparison, the VW, Audi and Porsche brands combined increased sales by 2.4 percent. Both companies struggled in Japan during the first half, where demand has been weak since last year’s sales-tax increase. Deliveries slumped 8.2 percent for the Toyota and Lexus brands and 13 percent for Daihatsu. Sales in Japan plunged 17 percent for VW, putting the brand on track to fall behind Mercedes-Benz as the top-selling import for the first time in 16 years.